About Wheeler Construction Award Winning Builder, Model Homes, Custom Homes, Commercial Construction, Affordable Prices. - Wheeler Construction Inc.
WHEELER CONSTRUCTION, INC. is an award winning Citrus County Home Builder established in Inverness Florida in 1984. 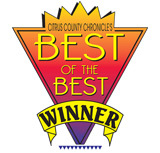 Award Winning Design - Wheeler Construction has won the "Best of the Best" award for Home Builder several times. Affordable Prices - Wheeler Construction, Inc. has made a name for itself by offering popular home styles at affordable prices. Custom Homes - Whether you purchase one of our models or desire a custom home, Wheeler Construction will help you design the best home, with the best features, for the best price. Personal Service - Wheeler Construction believes their continued success is based on the goodwill and satisfaction of their customers. At Wheeler Construction you'll have direct contact with your builder, superintendent, sales team, draftsman and color coordinator at all times - before, during and after the construction of your home. Ask for our List of Customer References! We take pride in every home we build and promise personal attention from beginning to end.